The value of remittances sent by migrant workers back to their native countries is widely recognized. Far less appreciated is the ‘resource backwash’ experienced by many sending households in terms of high debt burdens or reduced savings and assets. This column explains that as labor migration becomes increasingly temporary and circular in nature, remittances earned by migrant workers often cannot fully offset the costs incurred. This argument has profound implications for the debate about migration’s role in supporting sustainable development. Remittances sent by migrant workers from their host countries to their home countries have recently hit a record high after two consecutive years of decline. The World Bank’s April 2018 report shows that remittances to low- and middle-income countries reached $466 billion in 2017, an increase of 8.5% over $429 billion in 2016. Total remittances, which include flows to high-income countries, grew by 7% from $573 billion in 2016 to $613 billion in 2017. These remittances are the most visible ‘economic footprint’ of international migration, and they often feature in policy discussions on the role of migration in development. But what is almost entirely invisible is ‘resource backwash’ – the resources that flow away from migrant households in order to support and sustain the migration event. Circular migration from the global south often entails significant resource outflows from households who deplete their savings, sell precautionary assets and borrow money at exorbitant interest rates to finance the migration of family members. This process, in turn, diminishes migrant household resources, assets, and capacity in a manner that can impede subsequent economic wellbeing and create a damaging dependency on migration. In one of our recent studies, we use household-level data from Bangladesh to track the financing processes of international labor migration and related resource backwash. We find that although migration has become an essential livelihood strategy for many households in rural Bangladesh, households deplete significant resources in terms of land and other precautionary assets in order to gain access to migration opportunities in the Gulf and emerging Asian countries. Debt is a critical component of the migration system. 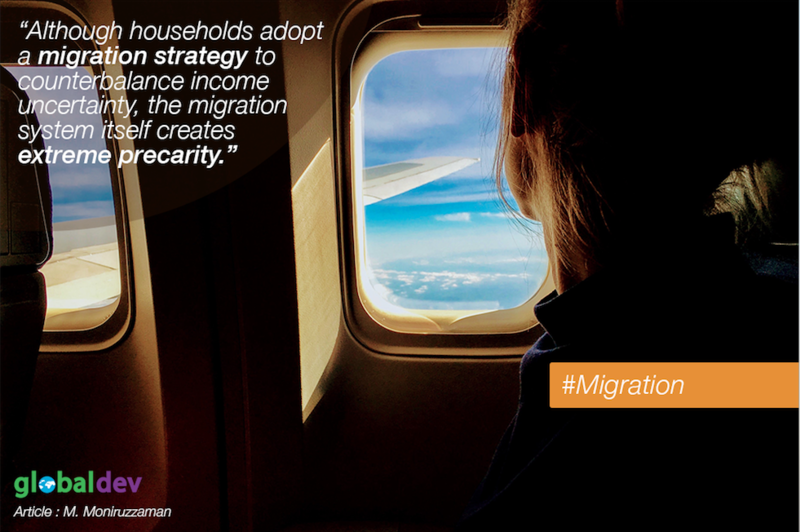 Although households adopt a migration strategy to counterbalance income uncertainty, the migration system itself creates extreme precarity, as households become riddled with migration-related debt. Tragically, it often takes the entire migration episode to service the debt. This argument has profound implications for the debate about migration’s role in supporting sustainable development. There is plenty of evidence globally of how migration and remittances can have a positive impact on the welfare of households left behind by increasing incomes, financing education, and healthcare, improving food provision, and increasing savings and investment. But migration is increasingly becoming temporary and circular with shorter episodic flows, and sadly remittances earned by the migrant worker often cannot fully offset the migration costs incurred. I argue that without incorporating the full costs, any assessment of the development impact of migration is partial. It is therefore extremely important to include resource backwash to investigate whether and how remittances received by the household adequately compensate for the loss of assets and resources associated with financing international migration. Migration is also viewed by the international development community as a ‘transnational livelihood strategy’ through which households diversify their livelihoods by allocating labor to geographically discrete labor markets. But the necessary livelihood conditions include household capacities and assets. Transnational livelihood through migration may not always reap greater opportunities and may actually end up reducing the capacity of the household if migration entails significant sunk costs and depletion of assets. Any analysis of migration as a transitional livelihood must incorporate migration-related costs and assess the degree to which they represent an inequitable and unsustainable resource backwash away from the source region. Migration issues have been explicitly included in five of the 17 Sustainable Development Goals (SDGs) and 169 targets. Migration and remittances are the center-piece of Goal 10, which has highlighted different strategies for reducing inequality within and among countries. Target 10.7 articulates the necessities of safe, regular and responsible migration and mobility through the implementation of planned and well-managed migration policies, while Target 10.c highlights the need to reduce remittance transaction costs to less than 3% by 2030. It seems that policy intervention on migration financing is critical to ensure affordable, safe, regular and responsible migration and mobility of people. Therefore, understanding migration financing is important to achieving the targets for the SDGs. It is vital to adopt a ‘holistic approach’ to research on migration and remittances regarding the general wellbeing of recipient households. If migration-related resource transfer is conceptualized only as a one-way flow from the migrant destination back to the source region through remittances and other resource flows, it will produce an inaccurate understanding of the true global resource circulation linked to international migration. The sooner we understand this reality, the better we will be able to comprehensively chart the resource gains and losses associated with contract-based labor migration systems. Mohammad Moniruzzaman is affiliated with International Migration research Centre (IMRC) in Canada. His broader research interest includes economic and environmental migration, migration and food security interlinkages, tools and metrics of food security assessment, modeling household food security.